BRINGING BACK THE DENIM SKIRT! As if we couldn't get enough denim in our lives, the denim skirt has made it’s way back from the 90’s in full force! This might be a flashback to your childhood, but don’t let that scare you from giving the denim skirt a second chance. It’s interesting how an item that was once mainstream, but fell out of fashion, can come back years later. When styled the right way, a denim skirt can look effortlessly chic and put-together. As of matter of fact, I’m loving the updated silhouette on today’s denim skirt, and it really is one of those trend you can wear in the colder months as well. The current skirts come in a variety of silhouettes—fit and flared, slim and straight, and the list goes on—so it’s important to find one that perfectly flatters your shape. While denim shorts are still very much in, I'm so pleased to see the denim skirt return to the mix. The rules of pairing with a denim skirt are very much the same for that of denim shorts, after all, both items go with just about anything. Pare down the toughness of a denim skirt by teaming it with a feminine blouse with subtle lace detailing. 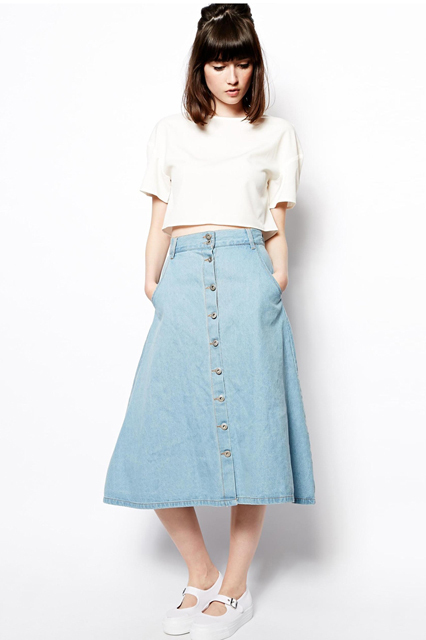 A denim skirt designed in a twirly skater cut style is fresh, feminine and summer-appropriate. Pair it with a tucked in white tee and then layer it up with a denim jacket in a darker blue. Midi skirts are all the rage this year. Partner a denim midi full skirt with a striped cropped top, sneakers and a pair of statement round sunglasses for a look that is contemporary. Don’t limit yourself to one denim piece when you can chuck on a denim hat to flaunt your love for all-things denim. Update your denim look by pairing it with current styles like denim on denim, a cropped sweater or oversized clutch . The possibilities are endless when it comes to something this versatile. Like your growing supply of jeans, chances are you’ll want the denim skirt in every shade—even with distressed details. What do you think of the denim skirt trend? Would you wear it? If so, which denim skirt style do you see yourself wearing? Do you go for the mini, midi or maxi? Share below and let us know! Did you know that the first denim skirts were made by hippies in the 1960s who came up with the idea of turning old denim jeans into long denim skirts?